Not really Gn15 but funny. Not bad for a rabbit warren tail-chaser. must admit, I prefer these mini layouts when they stay in the case, otherwise the point of the exercise/challenge gets lost . 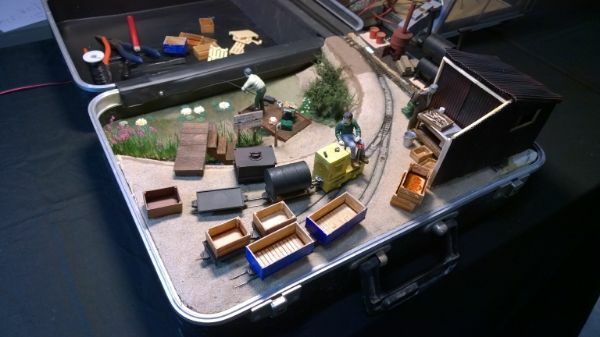 There was a similar sized cased layout being marketed in T gauge. I think a minimum gauge layout using the HOf models would work well. What an amazing and creative layout. Well done! If only I'd looked more carefully I'd have noticed that Jon put the link in anyway. Oh dear, time for new glasses I think. Chris Stockdale wrote: time for new glasses I think. that's the problem when an alternative word is used instead of the link address, easy to miss, especially when the eyes start to go.